Respond to a changing planet by leading initiatives to implement sustainable practices. Learn the science of sustainability and help both businesses and people transform careless behaviors into mindful habits. Explore the broader field of sustainability, choose a concentration or customize your own emphasis. Study under academically credentialed and real-world sustainability practitioners. Gain field experience to see how theories become tangible and how problems become solutions. Grow and network with your cohort to eventually participate in a growing discipline that impacts every sector. Hone in on almost anything—from the move toward green schools to alternative food systems to renewable energy in construction, sustainability is transdisciplinary and diversely relevant. No matter your academic or professional background, sustainability impacts your future. By the time you’re finished, you’ll be equipped with a holistic approach that helps focus on the triple bottom line: people, profit and planet. Add regenerative energy to your community and the world. Our degree grounds you in the three pillars of sustainability: natural sciences and environmental studies, business and economics, and social sciences. Despite their diverse interests and aspirations, our students share a passion for managing people and projects to solve sustainability problems. Courses in your chosen concentration help you develop a robust understanding of an area of application and are designed to prepare you professionally. 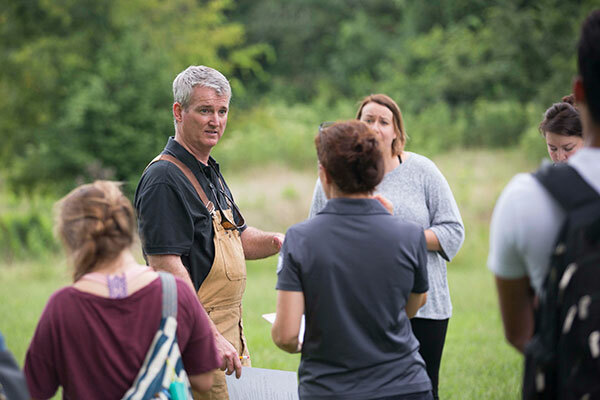 The required travel course and capstone project are opportunities for students to see sustainability practices in action as well as develop their own applications of what they've learned throughout the program. *Students may pursue appropriate professional certifications as a part of courses within the chosen concentration. Candidates pursuing the dual degree must meet admission requirements for both the sustainability program and the MBA program. SU 609V - Sustainability Travel to [Destination] (3) Offered for variable course credit.